← Time To Go Shovel The Sidewalk, Princeton! New Brunswick, NJ Is America’s “5th-Most Exciting Small City’. Why? New Jersey is too often the target of sneers, but a recent survey of “America’s Most Exciting Small Cities’ showed two Garden State towns in the Top 5. 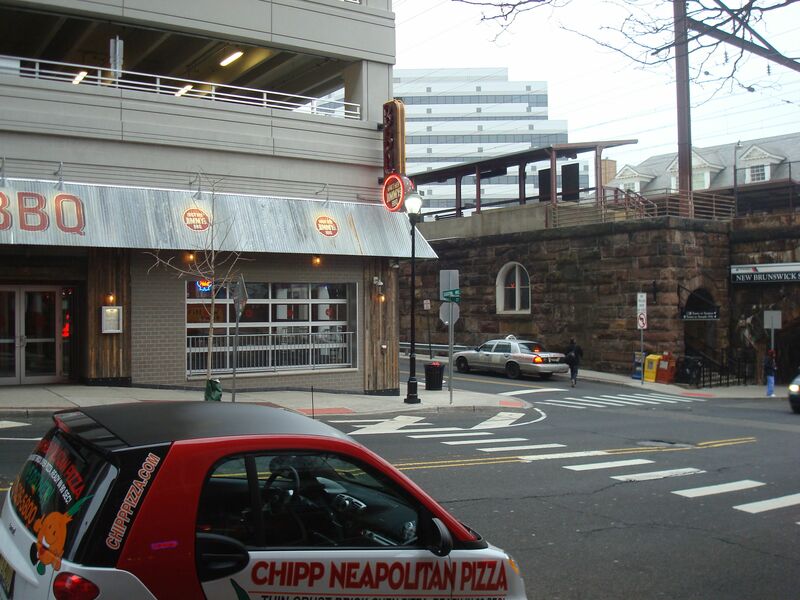 In fact, Hoboken topped the whole list! Meanwhile at #5…New Brunswick. Seriously? First what does it mean to be an ‘Exciting Small City’. The study, cooked up by a real estate firm no doubt looking for some free publicity, measured places of 50,000-60,000 residents (which means Princeton couldn’t be included – too small). The ‘small cities’ were evaluated based on number of young people, number of parks, restaurants, live music, percentage of restaurants that aren’t chains, etc etc. New Brunswick is a city with plenty of issues. Post-industrial blight led to the exit of residents who could afford to get out, leaving a town with a large low-income community. Early urban renewal efforts arguably stripped New Brunswick of much of its historic character. Meanwhile, a cluster of non-profit hospitals and the Rutgers University campus means a substantial portion of the city is generating no tax revenues. Malls in Somerville and Route 1 decimated business at downtown merchants. Once you get in a slump like that, it’s hard to get out of it- just look at Trenton, where businesses are still fleeing and taxpayers groan under the weight of municipal debt taken out for a disastrous publicly-supported hotel project. Why is it then, that New Brunswick is on the upturn? Part of it is no doubt the student population, but they were also there when the town was hitting the skids. Another reason is that New Brunswick is capitalizing on the demand for compact walkable living. 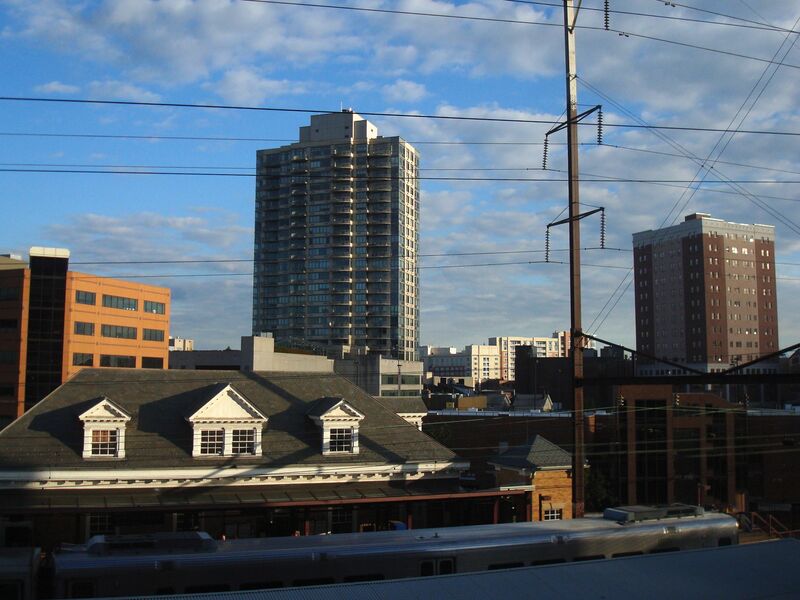 The skyline is marked by full-on skyscrapers, providing new apartments and condos within footsteps of the downtown and rail station. It’s easy to criticize these developments as catering primarily to yuppies, but in a town with no tax base, every tax dollar is no doubt welcome for what it does to consolidate and improve the local schools and public amenities. New residents also sustain an increasingly lively downtown, with brewpubs, theaters and restaurants (although you don’t have to look far for some pretty down-at-heel sections). New Brunswick also has a forward-thinking attitude to upgrading local streets and throroughfares to make them safer for pedestrians and cyclists, and more attractive places to be. In 2011, the city passed a specific ordinance requiring drivers to allow a minimum 3-ft distance when passing a cyclist. In 2013, New Brunswick held a ‘Ciclovia’, where downtown roads were closed to cars and thrown open for walkers, cyclists and street parties. Local parking garages have charging stations for electric cars – something that you won’t see in Princeton. 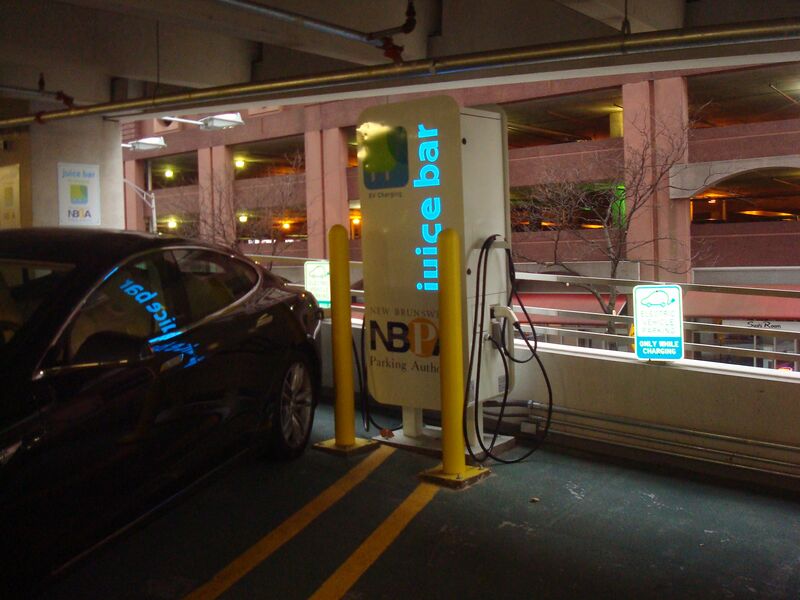 New Brunswick Parking Authority ‘Juice Bar’ where electric cars charge while parked. Car in picture is a Tesla Model S (click to expand). Compared to Princeton, New Brunswick features more-affordable housing at every point in the market, but remaining crime and deprivation are likely to be a turn-off for many would-be residents. That said, New Brunswick is realizing many of the advantages of promoting walkable and transit-oriented mixed-use development, and could get better and better in future. The height of the new buildings in New Brunswick (up to 23 levels in the newest luxury tower) would clearly be out-of-scale for Princeton, but for a city like New Brunswick, they offer a way to capture value from desirable locations close to university facilities, downtown amenities and a direct rail connection to New York. Have you visited New Brunswick recently? How do you think the town has changed recently? Do you know anyone who has moved there, and would you ever consider living there yourself? Let us know your stories using the comments section below. This entry was posted in Affordability, Density, Local, Real estate, Smart Growth. Bookmark the permalink. 4 Responses to New Brunswick, NJ Is America’s “5th-Most Exciting Small City’. Why? Notice on that real estate blog, crime rate isn’t a factor. Exciting! Hence Saginaw ranked #27. The only reason why New Brunswick ranked #5 is that it’s #3 in the percentage of young residents. Don’t get me wrong there is some great stuff going on but some horrible stuff too. The new architecture in New Brunswick is mostly of the “Garbitechture” variety and the city has an obsession with parking decks. Shoot! without a doubt. more than half the new square footage in the city has been parking decks! At $40,000 to $50,000 a spot these things get REALLY expensive really fast! Still there are some really cool things going on for bikes in peds in New Brunswick that Princeton could learn from. Oh yeah! “Walk to train to NYC” is a BIG BIG BIG reason why young professionals are looking at New Brunswick. Too bad it took so long for the city to realize this potential. I am from Houston, Texas. So when I moved from the slower paced south to the hustle and bustle of the East coast I loved it and what New Brunswick had to offer. It was if they took a big city and shrunk it down to the size of a large town but left everything; that’s the best way I can describe it. It had everything Houston has except you didn’t have to drive forty five minutes to get to what you want like you do in Houston. I must say that the skyline is impressive do a city of its size and population. It has a better skyline than a lot of cities in Texas that are way more populated than New Brunswick.